"Fine. Refuse your mother's kindness." "So you're saying you've come to pay your mother a visit?" The above info came from KJ91, and was edited by yours truly (contact me). The image came from Wikipedia. 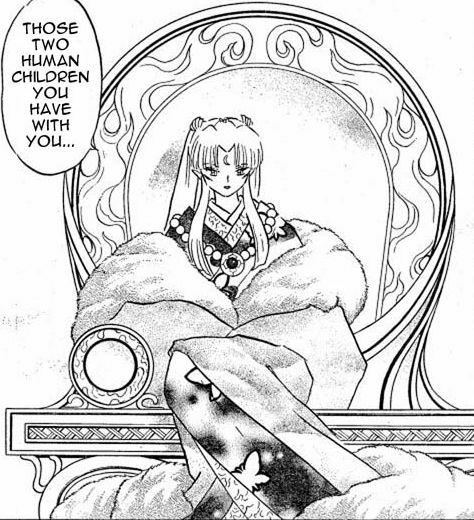 Sesshomaru's mother was just recently introduced in the 466th chapter of the Inuyasha manga, and she has yet to be named. His mother is, like her late husband InuTaisho, a taiyoukai who possesses great power. Sesshomaru's mother also has a necklace which can open a gate to hell. Sesshomaru goes through the gate to strengthen Tensaiga and to save Rin. Even though Tensaiga is strengthened he can't save Rin. Sesshomaru's mother then uses it to brings Rin's soul back from hell. 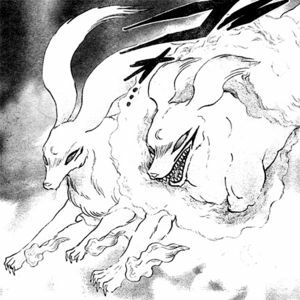 This happens from chapter 466-470 of the manga. The above description came from KJ91 and Tatsuyoshi, and was edited by yours truly (contact me).